How did you celebrate the Halloween yesterday? Did you join the makeup Halloween Party? W ell, Maybe you would rather stay at home with friends and enjoy great Halloween movies, or want to backup your Blu-ray MV disc to HDD for viewing more than one time. Whatever, you’re in the right place. Follow this guide and know how to rip Blu-ray MV disc to HDD with best format. How to transfer Blu-ray MV disc to HDD? In actually, you need a Blu-ray Ripper to rip Blu-ray Disc to HDD Supported video format. Here, We recommend you the best Blu-ray Ripper for you. 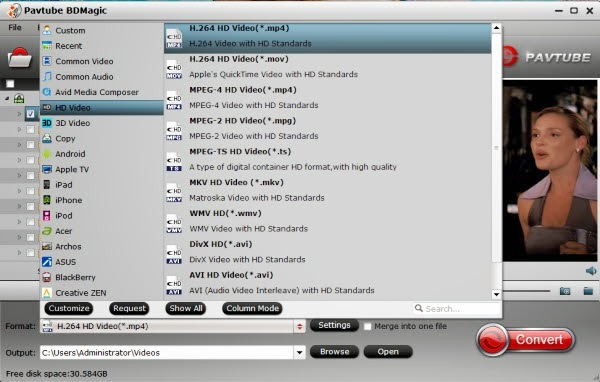 Pavtube BDMagic can help you copy Blu-ray digital copy to computer, and you can convert Blu-ray Disc to any video/audio format. You can play the ripped Blu-ray MV musics on HDTV/Smart TV via USB, play converted Blu-ray on iPad Air 2, play converted Blu-ray music on car via MP3 player, watch converted Blu-ray movies on Galaxy Tab S etc. You can free download the trial version then install on your Windows or Mac. Step-by-step: How to rip Blu-ray MV discs to HDD for repeat watching? Note: Now, you can get 50% disscount, if you sharing your Halloween videos to YouTube, and send the URL of your YouTube video to dvdwinsupport@pavtube.com or dvdmacsupport@pavtube.com. And get 50% off on any converting tool from us. More details you can read here. Step 1. Free download Pavtube BDMagic , install it onto you computer. Step 2. Insert Blu-ray disc to your Blu-ray drive. Run this top Blu-ray Ripper, click “Load Disc” icon to load Blu-ray files from Blu-ray rom. Step 3. Now go to “Format” menu to select output format there. A variety of options are listed such as many portable devices, video editing software, various HD video formats, etc. Choose the one you desired. 1. You can hit the Copy the entire disc icon on BDMagic main interface and start Blu-ray backing up process. 2. You can find the “Directly Copy” option there. It will support to backup 100% intact the blu-ray main movie with all multiple tracks preserved. And you will get one M2TS file for output. If you want to backup blu-ray, it is a good choice for you. By the way, if you want, you can adjust output video and audio parameters according to your own needs. You can change bitrate, frame rate, channels, etc. Click “Settings” button to set output profiles. Step 4. Click big Convert button on the interface and then you will get a conversion dialogue box to show the exact progress, like time left, estimated size, state and so on. Note: If you are bothered about waiting for conversion to finish, you can choose to check “shut down computer after conversion”. Then just let it alone, you are free to go out to do anything you like. With it you can take your favorite Blu-ray MV discs to HDD for watching one more time and enjoy them on Halloween whenever you want to. Just try it now!